Cost: Level 1 of Barky Dog is $300, for a total of 6 sessions. You may also buy a package of 6 sessions along with a one-on-one session to give you a head start before your first class, or after class to troubleshoot any remaining problem areas. “What are the goals? What will my dog need to ‘graduate’?” Dogs completing Level 1 should be able to refocus on their owner after noticing another dog; walk alongside another dog 10 feet away; approach and pass another dog. “Will my dog ‘graduate’ after 6 sessions?” This depends entirely on your dog, and on your ability to work between classes. Most teams are able to move to Group Hikes after 6 sessions. If your dog isn’t ready, you can continue signing up for Level 1 sessions for as long as necessary. 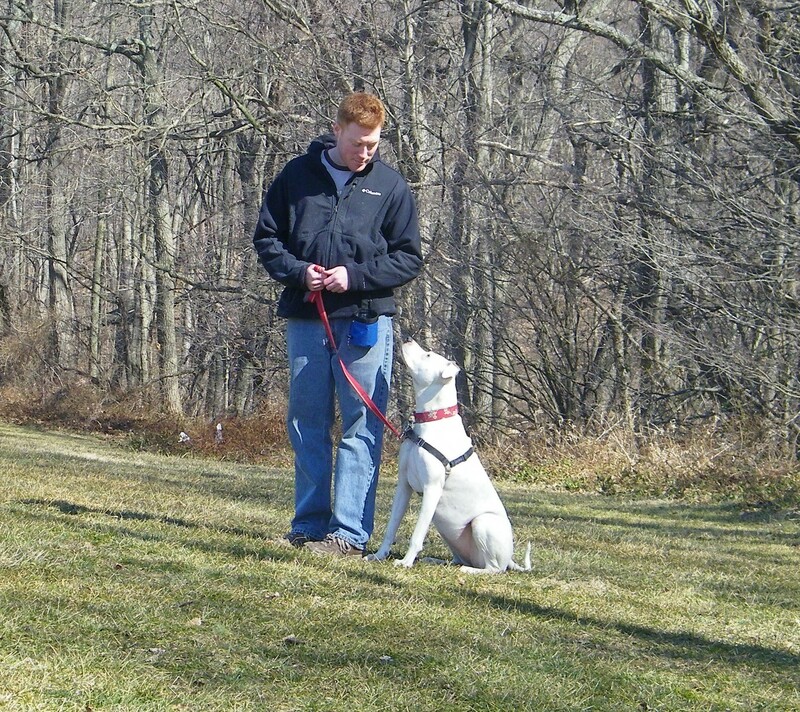 “Is this class right for my dog?” This class is for dogs who bark, lunge, or otherwise make a scene when they are in public on a leash and see another dog. These behaviors can be rooted in fear, anxiety, aggression, or over-excitement. This class is not appropriate for human directed aggression or reactivity (though we would be happy to help you in private sessions). If your dog has a bite history (has broken skin on another dog), we will need to discuss with you whether your dog would do well in class. Safety is our #1 priority. “How many dogs will be out at one time?” To start, just one! We will begin with one dog out at a time, and slowly introduce non-reactive decoy dogs in to the picture. As class progresses, other Barky Dogs will be able to work at the same time as their classmates. To do this, there will be occasions when the dogs will need to wait in the car. Please bring whatever is necessary for your dog to be comfortable for 15 minutes in your car – crates, stuffed kong toys, bones, another person, etc. We prefer to have you with us in class, even when your dog isn’t working, as you will gain a TON from watching the other dogs! If there is no way your dog can wait in a car without panicking or being destructive, please contact us and we will see what other arrangements can be made. Hands free leash such as RuffWear Flat Out leash, or you can make your own by looping a 4 foot leash through a belt. Secure equipment! We highly recommend the Freedom Harness. An EasyWalk is also acceptable, but is not as well made. We would prefer dogs to be on harnesses for better control – however, if you must use a collar instead, it will need to be a fabric martingale collar so the dog cannot slip out of it. Head halters such as the Gentle Leader are also acceptable. High value treats – no exceptions! Must be along the lines of chicken, hot dog, cheese, etc. Choose your class sessions below! Make sure to choose 6 or more.